In our family, there was no clear line between religion and fly fishing. The loosely-biographical story revolves around a family in Montana in the early 1900s. Norman, the older brother, narrates his adventures fly fishing with his younger brother, Paul, and occasionally with their father and cousin. Paul is a master fisherman with great ability, but he has a habit of drinking and bar fighting and landing himself in the sherif’s custody. Norman and his father, a Presbyterian priest, try to help Paul turn his life around as they fish and put up with wives and in-laws together. What I learned most from this book is simply that you can’t make decisions for somebody else. As much as you want to preach the truth that grains are evil, or cardio ain’t that great, people will make their own (illogical) conclusions. As the saying goes, you can lead a horse to water, but you can’t make him drink. In Norman’s love for his brother I saw my own love for people with ability that are willing to learn. In Norman’s struggle to help his brother, I saw my own struggle with people with ability that so often seem to squander it. We can love completely what we cannot completely understand. 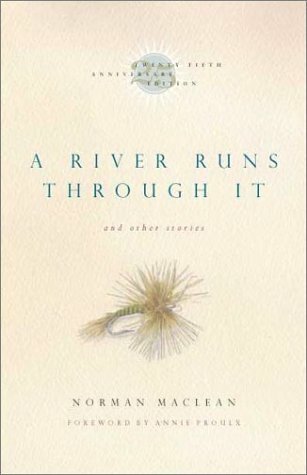 The author, Norman Maclean, was a literature professor, and he certainly knows how to write fine literature. There were no chapters or breaks in this book; the words of the story flowed together like, well, a river. And some of the prose was so beautiful that I read it over twice or more. If you do any kind of writing, I recommend reading this book just to see how Maclean wrote it. Now, granted, not everyone will find this novel—novella, really—to be as influential as I have. Other reviewers have said this book tends to be boring (I wonder—are they just boring people?). Regardless, I think you should give this one a try. You might be surprised at how well it speaks to you. You certainly will be surprised at how well the story flows. And, besides, it’s a pretty short read. “Well,” he said, “the first thing I noticed about this hole was that my brother wasn’t catching any. There’s nothing more noticeable to a fisherman than that his partner isn’t catching any. I was thirsty to start with, and the cigarette made my mouth drier so I flipped the cigarette into the water. “Then I know,” he said, “if there were flies in this hole they had come from the hole above that’s in the sunlight where there’s enough heat to make them hatch. Now that’s some writing I could get eat for dinner! I am a cousin to Norman MaClean. This was a great book and movie, “A River Runs Through It!” I am his father’s brother’s great grand child on the Canadian side that came out of Nova Scotia. We settled in Southern Manitoba. We are proud of our cousin and his family.